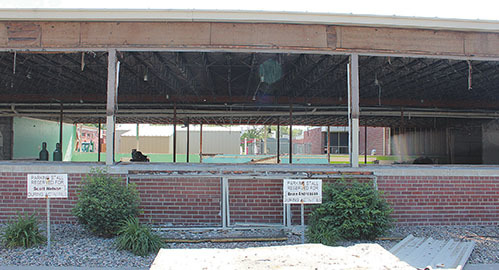 CLEAR VIEW — With demolition completed last week, passers-by could see all the way through the 1956 elementary wing at Boone Central Public Schools. Only the steel roof and portions of the exterior walls remained in place. Build-back of the new classroom areas is expected to begin soon, and all new windows will be installed. 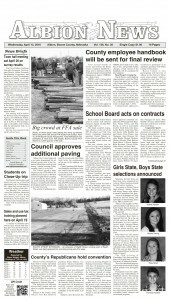 A big push is underway now on the Boone Central Public School addition and renovation project in Albion. Workers are busy in every part of the building, with an important project deadline approaching. Sampson Construction, the general contractor, is to notify school administrators of progress on July 1 to determine when the 2017-18 school year can start. If progress is sufficient by July 1, the school year will likely start by late August. If not, classes wouldn’t begin until after Labor Day weekend. “Right now, we’re looking good to meet our goals for that date,” said Niessen. He estimated 65 to 75 individuals are working each day on the site. This includes nine Sampson Construction employees. Nate Karstens, project manager, is now on site daily. About 14 to 18 subcontractors have workers on the site each day, Niessen said. Some of them have been working weekends to get caught up. On the building addition, most work outside the structure has now been completed, but crews have plenty left to do inside the building. Renovation of the elementary wings is beginning even as demolition is wrapping up. Complete demolition of the 1956 elementary addition left only the exterior walls, roof and support posts standing. All interior walls, floors and windows were removed and will be replaced. Details in the June 7 Albion News & Petersburg Press, Print and E-Editions.